Figure Friendly Friday is back! Hope you have had a great week. I'm sharing a simple soup recipe this week. This linky party will be for recipes that come in under 500 calories. Recipes or methods from desserts to soups and everything in between. However, if your recipe does not fit the 500 calorie goal, I'll have to delete it. There are a couple of free calorie counters, but I really like sparkrecipes.com. Please list the calories per serving somewhere in the recipe for everyone to see. Also, please link back to Family Stamping and FOOD! and be sure to visit the other participants. I'm hoping for a successful linky party so let your friends know! 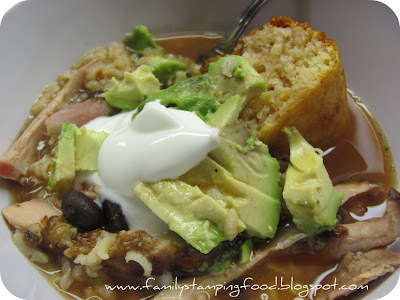 This week I'm sharing a Tex-Mex take on a classic American soup...Mexican Chicken and Rice Soup. Add everything (except avocado and sour cream) to a slow cooker and place on the high setting. Cook for 4 hours until heated through. Serve with 2 Tbsp diced avocado (+38 calories) and 1 Tbsp reduced calorie sour cream (+20 calories). Round out the meal with a small sliver of cornbread. Looks like we're traveling the earth, you have Mexican soup, I have Italian. It's all good! Candi, I really hope your linky party takes off. I don't really know the calorie content of my recipes, but I'll go through and figure one out to post. I love this idea, but how do I know my dish is under 500 cal? Growing up in the tropics, I love love chicken and rice! 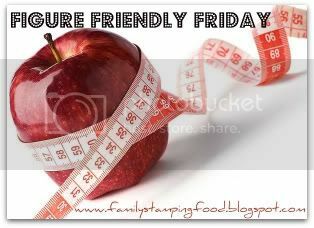 I would want to join figure friendly soon... :) Thanks for sharing! That looks like a wonderful tasting soug. I love the addition of the avacodos on top. This look so good!! My hubby loves Tex-Mex and will relly enjoy this I think. I am following from the Tuesday hop and look forward to more great goodies!! Thanks for sharing this one. :) Have a great day. This sounds like an amazing soup to me :) Thanks for sharing it with Hearth and Soul Hop ! I LOVE Mexican soup...but I always though a few stale tortillas in mine!! This would be perfect for my Foodie Friday linky party - stop by this week and link up!